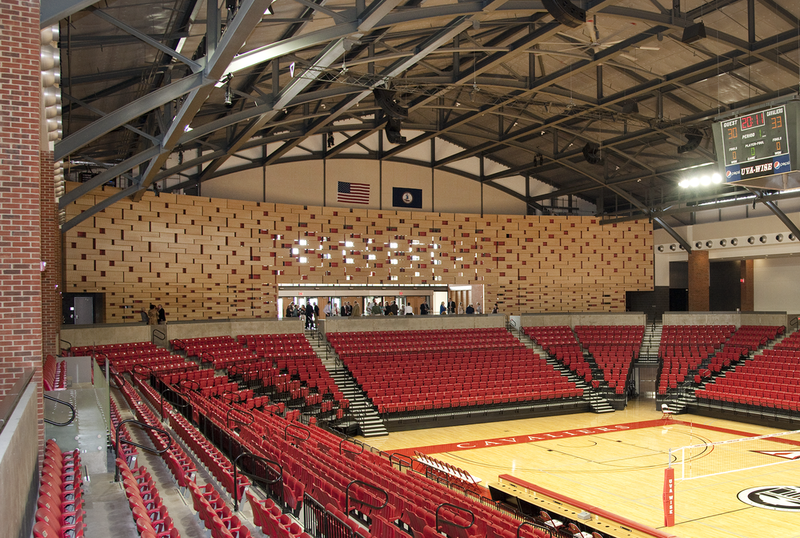 As the focal architectural element of a 3,000 seat multipurpose arena at the Wise campus of the University of Virginia, this screen wall provides a backdrop to all arena events, including sporting events, concerts, and university ceremonies. The double-sided wall measures approximately 150 feet long, 30 feet tall, one foot thick, and curves along a 122-foot radius to meet the predetermined geometry of the arena—approximately 7,000 square feet of surface area. In addition to creating the primary entryway from the arena’s lobby into the main concourse, the screen wall conceals mechanical chases, restroom entrances, and a maintenance stairway while providing acoustic attenuation. The wall assembly integrates a cold-formed steel frame, maple plywood panels, and acoustically absorptive backing; a dynamic patterning of panel geometry and perforation responds to the varying degrees of visual and acoustic permeability required in different areas of the wall. This design research project reinforced the importance of a collaborative design/build approach between architects and fabricators at all stages of development. 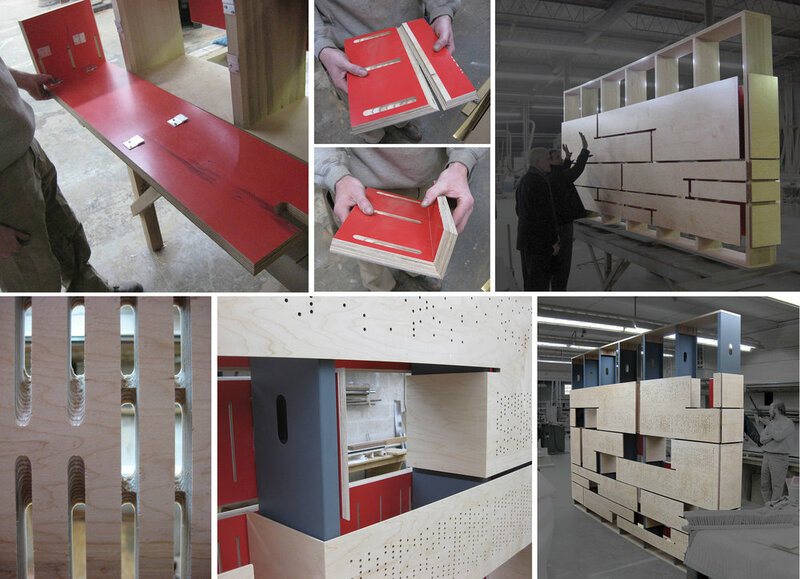 The design and fabrication team included members from academia, the architecture profession and woodworking industry; students, faculty, architects and woodworkers with over 30 years of experience worked together to develop this project from conceptualization to final installation. The scope of the project challenged everyone to step outside of their familiar comfort zone and to rely on each other to address a set of technically demanding parameters. As collaborators with different experiences and expertise, we shared a common value in the quality of craftsmanship and embraced new ways of thinking that compelled all involved to integrate conventional and emerging methods of making. Photographs courtesy of Tim Cox.